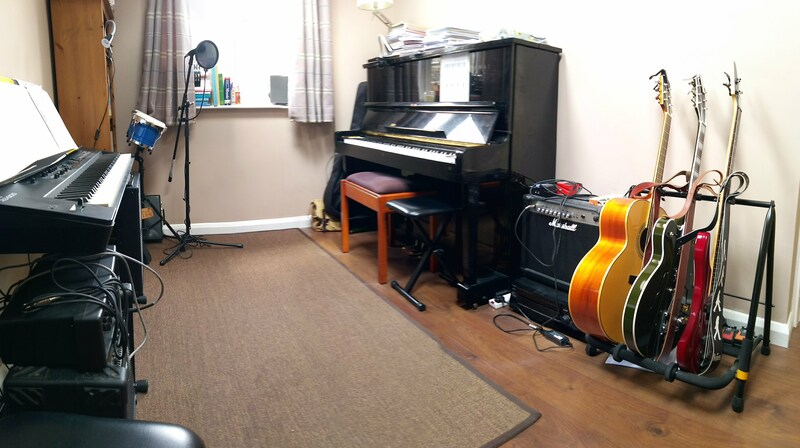 Based close to Skipton Train Station, I teach piano, guitar, bass and singing from my home. I live in the West Skipton area, a short walk from Skipton Train Station, just off Broughton Road. Our house is easily accessible on foot from Skipton Girls High School, Ermysted’s Grammar School and Skipton Academy. And, for those bringing younger children to lessons, or for people who live and work further afield, there’s plenty of on-street parking all around our property. Our semidetached house has been extended to include a fully equipped music room. Inside I have everything I need to offer students a complete musical ‘experience’: guitars and amps, effects units, two pianos, microphones, percussion, and recording / playback equipment. The room also includes a comfortable sofa – parents are welcome to sit and wait while their children have lessons if they so wish, or to leave them and pick them up afterwards. I try to foster a friendly, welcoming environment in which people of all ages can enjoy making music. From Skipton town centre, head out on the A6069 Broughton Road. You will pass Skipton Train Station on your left hand side then pass under the Carleton New Road bridge. With the railway sidings on your left, continue until you come to the Broughton Road Community Centre, in front of which you turn right. My house is 100 yards up, on the corner of Thornton Street and Bowling View. From Ermysted’s, Skipton Girls and Skipton Academy you can walk through Aireville Park and join with either Broughton Road or the Leeds Liverpool Canal. The footpath down from the canal into our neighbourhood brings you out onto Clitheroe Street – two streets past ours. To get to my house from there, simply drop down to the crossroads and turn left. You might find it useful to know that there’s a children’s playground straight opposite our house. It’s quite common for parents to take their younger kids to play in the playground while I teach. Other parents use their child’s lesson time to get some shopping done: Morrison’s supermarket is a short drive away, as is the ever popular Keelham Farm shop. Alternatively, you could stay with your child in my music studio during their lesson – if you would like to use my WiFi internet connection just ask for the password.